The Province of Verona (Italian: Provincia di Verona) is a province in the Veneto region of Italy. Its capital is the city of Verona. The province of Verona has an area of 3,096.39 km2 (1,195.52 sq mi), the second largest province in the Veneto region, after the Belluno province, and is the most western of the provinces of the region. Most of its territory is almost flat, with few mountains. The highest point of the province is Cima Valdritta, that is 2,218 m (7,277 ft) high.. The main river in the province is the Adige; it flows through the capital of the province. To the west of the province is the Lake Garda (Italian: Lago di Garda), the largest lake of Italy. The climate in the city of Verona is Humid Subtropical climate (Köppen climate classification: Cfa). The province of Verona borders to the north with the Trento (Trentino-Alto Adige/Südtirol region), to the east with the Vicenza and Padua provinces, to the southeast with the Rovigo province, to the south and west with the Lombardy region (Mantua province) and to the northwest with the Brescia province (Lombardy region). As of 1 January 2016[update], there are 922,383 persons living in the province, for a population density of 297.9 inhabitants/km². The largest comune is Verona, with 198.92 km2 (77 sq mi) and the smallest is Concamarise, with 7.91 km2 (3 sq mi). The comune with fewest inhabitants is Ferrara di Monte Baldo, with 226 inhabitants. The following shows the 10 comuni with more inhabitants with their population, and their area and altitude. City wall in Villafranca di Verona. Duomo di San Martino Vescovo, Legnago. Palazzo Municipale, San Giovanni Lupatoto. ↑ "Presidente" (in Italian). Provincia di Verona. Retrieved 26 June 2017. ↑ "Provincia di Verona" (in Italian). Tuttitalia.it. Retrieved 26 June 2017. ↑ 3.0 3.1 3.2 "Statistiche demografiche ISTAT" (in Italian). Demo.istat.it. Retrieved 26 June 2017. ↑ "Cima Valdritta, Italy". Peakbagger.com. Retrieved 26 June 2017. ↑ "Verona, Italy - Köppen Climate Classification". Weatherbase. Retrieved 26 June 2017. ↑ "Comuni in provincia di Verona per popolazione" (in Italian). Tuttitalia.it. Retrieved 27 June 2017. 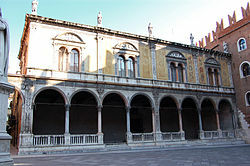 Wikimedia Commons has media related to Province of Verona. This page was last changed on 27 June 2017, at 17:05.